Samik Ghosh, Tukiso Mateka and Dayanand Virasamy. App development specialist firm Neutrinos officially opened doors to its Johannesburg-based office yesterday - a first in Africa. The firm, which has offices in Singapore and India, also launched its new skills development initiative - Winds of Change - which aims to aid the most unskilled person to someone with years of development and coding skills in application development by making its platform user friendly. "There is a massive skills shortage in the ICT sector, and although it is one of South Africa's top employers, the demand for skilled workers is not being met. Through the Winds of Change initiative we seeks to eradicate poverty by empowering people with various skills such as coding. 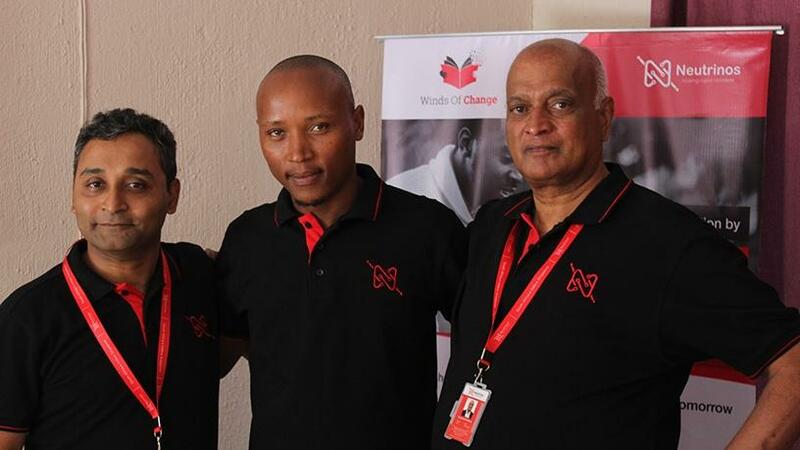 To start off with, we will be taking in 15 underprivileged youth between the ages of 18 and 23, of any gender, with or with a matric qualification but must have the hunger and passion to excel," explains CEO, Samik Ghosh. Ghosh adds that group will receive technical and self-development training over the next year while being paid a stipend, either by a corporate sponsor or Neutrinos. Employment opportunities will also be arranged for the group at the end of their training. Nicole Peterson, HR - transformation partner at the firm, adds that the initiative is not just a theory but has proven to be successful in other regions such as India and Western Europe. "We ran a pilot project by employing a young man Tukiso Mateka as an intern in November last year. Mateka was a Taxify driver and holds a matric but just two months into the programme he has learnt to develop an app [Edu-App] to help students like him who couldn't afford to study due to financial situations to find funding." "Our selection process is intense and includes an aptitude test, psychometrics exam as well as a number of interviews. As much as our approach seems disruptive - we do abide by the best practices and would like to reap the best of the crop. The selected will embark on this new journey as of 1 February 2018," she noted.